A recipe from Sue’s Italian cookbook, Lemon Ricotta cake. 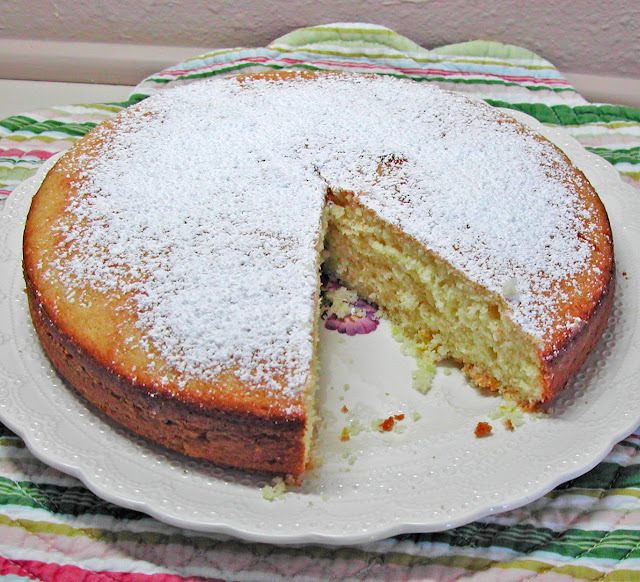 It is not a cheese cake as we know it, but a lemon flavored, Ricotta cheese, cake. Light, not rich and prefect just as it is or excellent with fruit or a sauce. Everyone enjoyed it with a cup of coffee and I think this is how I am going to serve it. I will make this again as while we all like cheesecake it really is something that everyone only wants one piece of and than I have to do something with the rest of the cheese cake. This cake however, will be gone by tomorrow I am sure. It is really cake not a heavy rich dessert and so just right for a snack in the middle of the day or later in the evening. Not at all difficult to make, I did use my springform pan as I felt the 9 inch pan I have would not be deep enough. If you use a regular 9 inch pan be aware that this will raise during baking like any cake so your pan needs to be deep enough. I had lemon juice and zest in the freezer so that makes it faster to get together. Grease a 9 inch round cake or springform pan. Line bottom of pan with parchment or waxed paper. Grease the paper. Dust with flour. Set aside Preheat the oven to 350°F. Cream butter and sugar until smooth. Beat in the ricotta cheese. Beat in the egg yolks, one at a time. Add 2 tablespoons of the flour and the lemon zest and juice. Put into the greased pan. Smooth top and bake for 45 minutes or until a cake tester (toothpick) inserted in the center of cake comes out clean. Allow cake to cool for 10 minutes in pan and then turn out onto a rack to cool. Remove paper if it sticks to cake not pan. When cool dust the cake with confectioners sugar before serving. *Fold, do not beat the egg whites into the egg mixture as the beaten egg whites help the cake to rise and stay tender. This is really good. If you like lemon you should try it. Glad the persimmons worked so well. If I had some I would have to try that. I had thought about using pears.